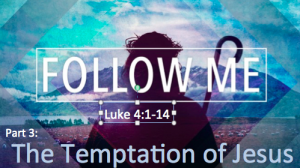 When Jesus goes into the desert to be tempted by Satan, he models how to defeat the Liar’s lies. God is pleased with Jesus before any recorded miracles, or healings, or preaching. Why? Because Jesus is God’s son. He’s pleased with us too. Why? Because we are his! But there is opposition to this truth. Satan does not want us to know the truth about God and what he thinks about us. He wants us to doubt God (and he does a pretty good job at this). God knows about Satan’s strategy, however, and he works things out so that we can not only stand firm against Satan’s lies, but actually grow in faith when we encounter them. That’s what we will see this week when Jesus is tempted by Satan in the desert. To prepare, read Luke 4:1-14. I also want thank Dallas for preaching last Sunday– and everyone who made the service possible in my absence. We had a wonderful time at my niece’s wedding in Philadelphia. Jesus goes to John the Baptist to be baptized before he gathers his disciples and begins teaching about the kingdom of God. 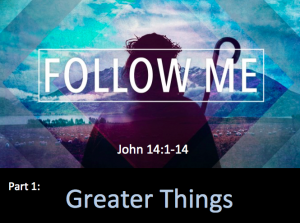 This story shows us several important things to consider as we follow Jesus. In my post this week, I forgot to mention that our service time is 9:00AM this Sunday due to the School of Rock’s Open House later that day. Please remember to come at 9:00 for the service! 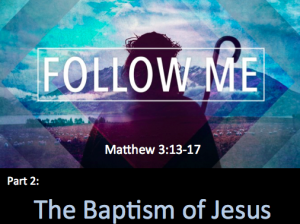 This Sunday, we will look at the beginning of Jesus’ formal earthly ministry– his baptism. Why did Jesus have to get baptized? Why did God say what he said? To prepare, read Matthew 3:13-17, Mark 1:9-11, and Luke 3:21-38. This is a pretty amazing statement by Jesus. What does he mean? Do we actually experience this? If not, how come? As we begin this series, we are challenged to be open to the fact that Jesus calls us to much more than most of us experience.